Abobe–Web Equivalent of the Devil? 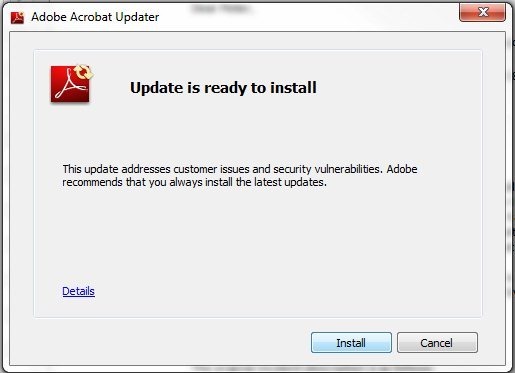 Is it just me or is everyone else SICK AND TIRED of Adobe and their constant updates? Doesn’t say much for their software when they have to update it what seems like DAILY. iPad 2 Launch–Was It Worth It? Yesterday saw the iPad 2 launch throughout the UK. If there is anyone left who’s not aware this was happening, back in April last year the iPad was launched in the USA, after several years of failed attempts to get a star-trek-style tablet on the market, Apple dared to go where others had failed.. and the gamble paid off as iPad sales went through the roof. By Christmas 2010 everyone and their auntie were promising iPad-killers and the full might of Chinese industry went into producing various sizes and shapes of tablet armed with the promising Android operating system – but no-one could match the price/performance of the iPad. By February the rumour-market was in full swing as manufacturers finally woke up to the fact that the tablet is here and terms Xoom, Galaxy Tab became household names. The Tab appeared in shops all over in large numbers, sadly that’s where most of them seemed to stay because despite the quality of the tablet itself, the software simply wasn’t ready for prime-time and Google themselves were the first to admit this. Then along came Gingerbread, the great hope for iPad alternatives – finally some real competition? Well, no. Many of us wondered if Apple would pull a rabbit out of a hat and it looks like they have. Firstly, the iPad 2 was launched in the US a couple of weeks ago and immediately the price of the original iPad went through the floor, effectively killing off the low-budget competition, friends of ours who bought iPads near the time of the launch of the new tablet were offered free upgrades by Apple who by now really HAVE gotten the knack of marketing in a way that their key competitor never really managed. So now we have iPads on Ebay and even being sold off as reconditioned by Apple themselves… meanwhile the suspense was building up for the UK launch and by mid-evening it was all over. I joined the queues in the MetroCentre in Newcastle at around mid-day and already there were a couple of hundred people on two floors queuing for the new device. Apple wasted no time in dishing out Starbucks coffee and water to the waiting crowds and before long sent their guys along to find out what everyone would be buying and giving them reservation tickets to ensure there were no disappointments. Apparently one poor soul had been queuing since the night before and the MetroCentre security guys would not let him stop overnight so I’m guessing it was a night in the car. Rightly so he was given extra attention by the staff. The whole production was very American, with a 5pm opening slot looming, staff in their hoards started clapping and cheering even though the rest of us were far too weary through standing all afternoon to show that much enthusiasm. Their noise certainly brought in the crowds and by now they’d succeeding in breeding a distinct “event” atmosphere. We were herded toward the shop in small groups in a very civilised fashion and as each person or family got to the store they were asked their names and assigned to a particular staff member who would not only take their money off them but give them any on-the-spot training or help they needed and all of them were friendly and knowledgeable. I can think of a few stores who could do with such training. Some heavy questions had to be answered.. was it to be white, or black, 16, 32 or 64 gig, with or without 3g, leather or plastic smart-cover… by the sound of it there were no real favourites, everyone had their own idea of what makes the perfect iPad2. There was a definite buzz in the brightly lit store as staff extracted countless thousands of pounds from the public in return for a hint of magic and punters stared in admiration at their new wonder-toy. By 7pm we were out of there, our choices being one black and one white iPad2, I went for the girly pink plastic, my wife went for the manly red leather. We both bought the incredibly stylish Bluetooth keyboard. So – was it worth it? You bet. It’s thinner, lighter and faster than the original, the glass is many times stronger, the new apps (Garageband and iMovie) are excellent, PhotoBooth is great fun and Facetime works a treat. I now have the job of re-installing hundreds of apps. Forget the rubbish you read about being good for games, I now have PDF and WORD readers program editors, video editing and I’ve just found a new bunch of business apps including database editors I didn’t know existed as well as CRM tools and many more vital business apps – oh, and some pretty good games. There is absolutely no doubt in my mind that Apple have on their hands not only a new winner in the iPad2, but an Android-killer in the now price-competitive original iPad. Arthur C Clarke came up with the phrase “Any sufficiently advanced technology is indistinguishable from magic”. Well, we’re not quiet there yet, but the Apple iPad 2 is only stones-throw away from magic”. Well done Apple.